A hearty combination of chicken, vegetables and potato gnocchi that can be served up as a precursor to a delicious meal, or as the meal itself. 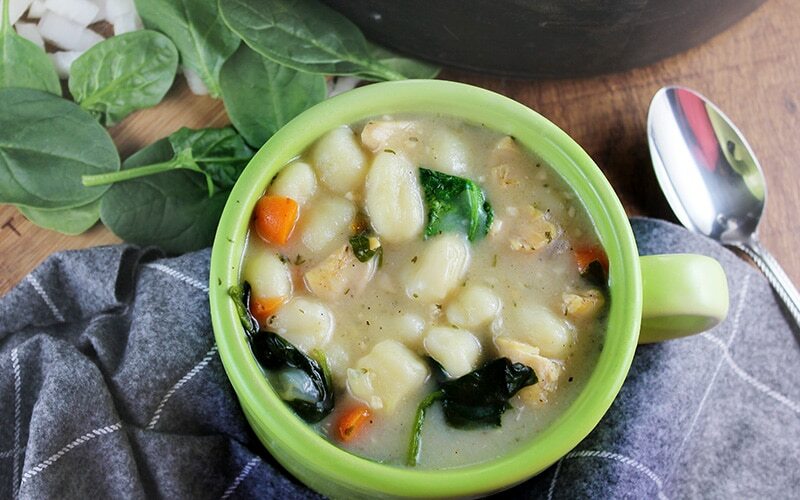 This Copycat Olive Garden Chicken Gnocchi soup recipe is everything and more. 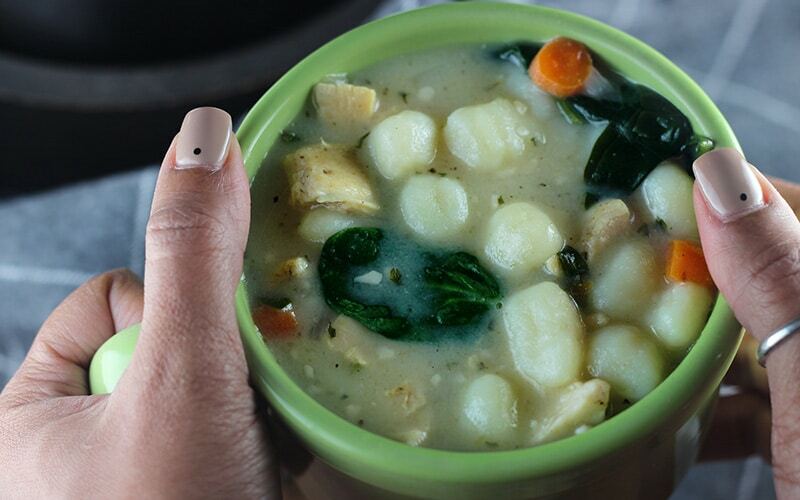 I am pretty sure I have shared with you my love for Olive Garden soups, and Chicken Gnocchi soup is no exception. I don't get to Olive Garden often but when I do, because I don't eat pork anymore, Chicken Gnocchi is always what I start with. It's been pretty cold around these parts lately. And while I wanna complain, I always check the daily weather for back home in Cleveland to remind of what cold really is. For a good while, I couldn't have my then favorite Olive Garden soup because it contained pork sausage and I removed pork from my diet. While I missed my favorite soup, Olive Garden had another one right behind it that soon became my new favorite. And also conducive to my diet restrictions. Their chicken gnocchi soup DOES NOT disappoint. Almost every recipe I make is usually inspired by a meal I have had at a restaurant or saw on a menu with my own touch. If you are like me, and love to go out to eat, but know that going regularly is not in the budget, I am happy to tell you that now you don't have wait to go to Olive Garden to get chicken gnocchi soup anymore. Because I have a copycat version of Chicken Gnocchi, in the same way, I did an at home recipe for my other favorite – Zuppa Toscana. I have a confession. Chicken noodle soup has never been a favorite of mine. Even if I am sick, chicken noodle does not make me think I'll feel better, or even be comforted by its goodness. But Chicken Gnoochi? Well yea, that will do the trick. 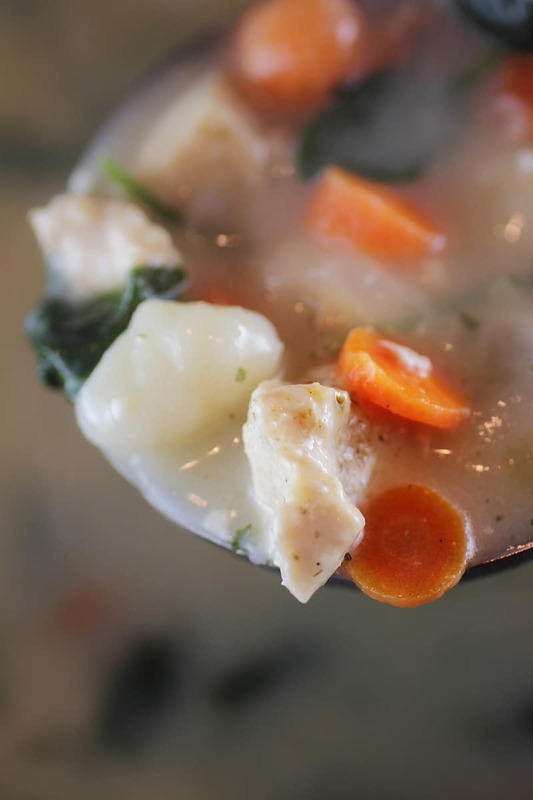 And just in case you are not convinced that Chicken Gnocchi is the best chicken soup ever. I have three reasons why it's better. Chicken Noodle Soup has minimal veggies. If you find a good one, there may be something other than carrots. In the form of celery. This Copycat Olive Garden Chicken Gnocchi has carrots, onions, and spinach. 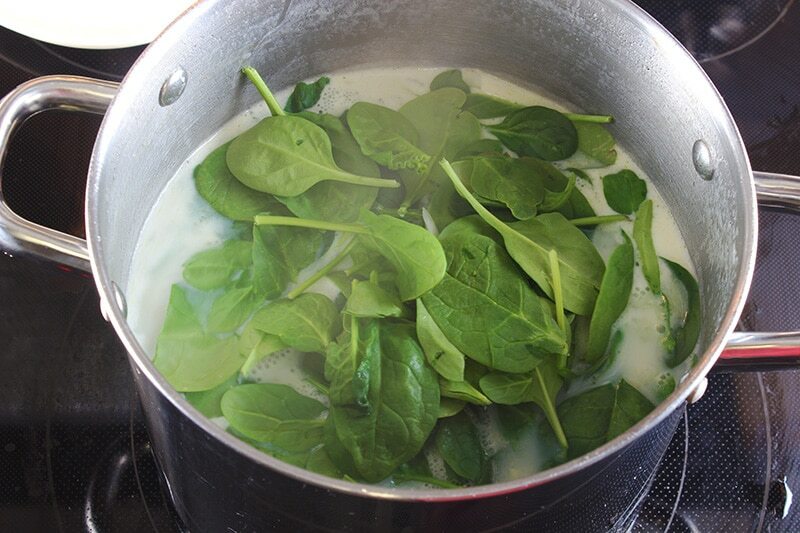 Spinach is amazing and delicious and great in soup. I don't know when I first discovered gnocchi but I thought they were wonderful. Better than noodles for sure. Any soup that has them can't help but be delicious, in my book. The only time I want a brothy soup is when I have a sore throat and trouble swallowing. But any other time, I want a nice hearty soup that is sure to fill me up. With these vegetables and the gnocchi, this soup is sure to do that. If you are not sold, I don't know what more you need right now. But you should at least give it a try. Gnocchi can be found in the dried pasta aisle at the grocery store. And believe it or not, Aldi even has it. You can also make your own Gnocchi. I have not gotten that adventurous, and because I like meals that don't take a lot of time, I do not know that I will. But you, you may be the adventurous type. And I am here for it! Homemade is always better! A not so average chicken soup that can be served as a side or meal. 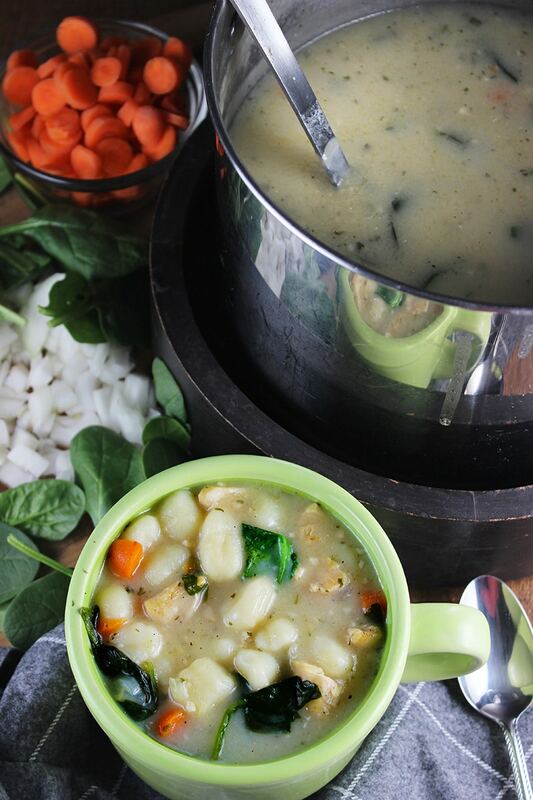 This copycat chicken gnocchi soup is better than chicken noodle anyday! The cornstarch mixture is added for thickness. If you prefer thinner soup, skip steps 10 and 11. Editor's Note: This post was originally published on April 24, 2017. 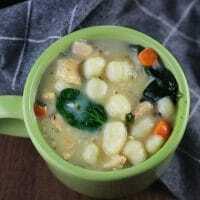 Interested in making Copycat Olive Garden Chicken Gnocchi Soup? Pin this recipe for later or share with friends using the buttons below. Yum! I love Olive Garden’s Chicken Gnocci soup, and this one looks so easy! I love soup in the summer, too! I’ve never put gnocchi in my soup but this inspires me! Can’t wait to try!